NOTE: I'm posting this for my friend Pandora, who is hosting the Orangeberry Summer Splash.....currently she has 70+ authors, so she needs another 30 to reach her target. This is a wonderful opportunity to publicize your books at a reasonable cost. Whether you're an Indie-author or a traditionally published, why not join us for this fun event to get the word out about YOUR book? 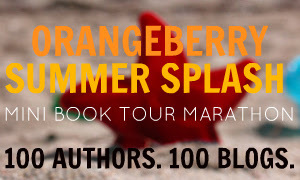 As Orangeberry Book Tours reaches its 100th book tour, I will be organising a special mini book tour marathon, Orangeberry Summer Splash from 1st August to 31st August. The goal is to get 100 authors and 100 book blogs to participate in this campaign that is set to raise awareness for all participating authors and books. AUTHORS - This is IMPORTANT. 4. Each blog host will receive a $5 gift as a token of appreciation and there will be a Kindle Fire giveaway so there will be a participating fee of $25 per book. 5. The purpose of this marketing campaign is to increase awareness for your book and the number of book sales or book reviews will differ from book to book. 6. This event is open to ALL authors and genres but please indicate the rating for your book accurately.